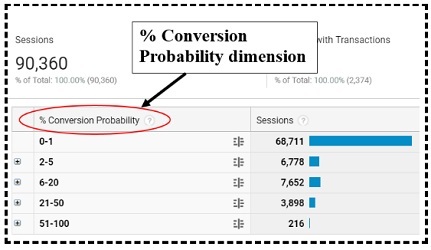 In the context of Google Analytics, ‘conversion probability’ can either refer to the ‘conversion probability report’ or ‘% conversion probability’ dimension. By default the conversion probability data is available in the conversion probability report. 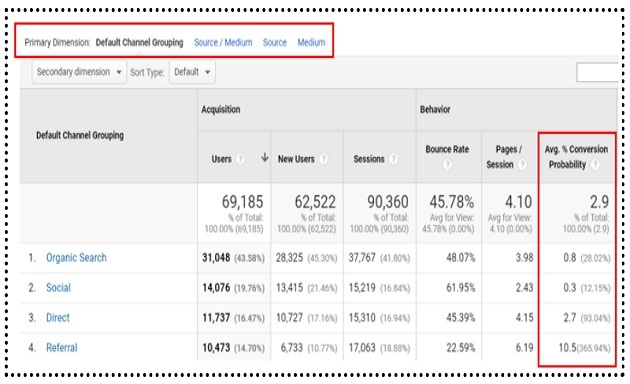 Step-1: Login to your Google Analytics account and then navigate to the reporting view which has been collecting ecommerce data for the last 30 days or more, with 1k or more transactions recorded in the last 30 days. Note (1): You will see the ‘conversion probability’ report in your GA view only when your reporting view meet the minimum requirement for calculating the ‘conversion probability’ data which is at least 1000 ecommerce transactions, recorded in the last 30 days. Note (2): In the context of ‘conversion probability’ report, a conversion means only ‘ecommerce transaction’. Thought this definition is likely to change in the future. 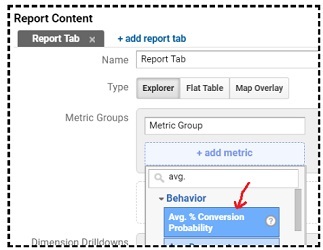 If your GA reporting view is not eligible for ‘conversion probability’ reporting then you can navigate to the Google Analytics Demo account to see the ‘conversion probability’ report. This report is available there. Minimum requirement for calculating and reporting on the ‘conversion probability’ data. Your GA reporting view must have recorded at least 1000 ecommerce transactions in the last 30 days for the ‘conversion probability’ data to be calculated and reported in your view. 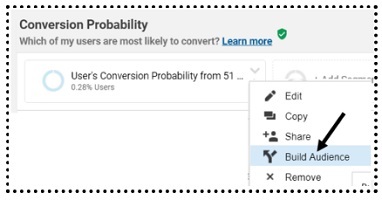 Once your reporting view is eligible for ‘conversion probability’ data, you will see the ‘conversion probability’ report in your GA view. Note (1): Once your GA view reach the initial threshold of 1000 ecommerce transactions, Google Analytics then needs 30 days of data to model. If the number of transactions in the reporting view falls below 1000 per month, then GA uses the last good model to generate data for the report. 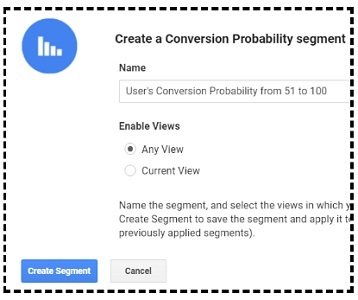 Google Analytics use machine learning to compute the ‘conversion probability’ data for your reporting view, provided your reporting view meet the minimum requirement for calculating the ‘conversion probability’ data. You can see the ‘% Conversion Probability’ dimension, ‘Average % Conversion Probability’ metric and the five ‘% Conversion Probability buckets’ through the ‘Conversion Probability’ report. ‘% Conversion Probability’ is a dimension which is an estimate of, how likely, a user will make a purchase on your website in the next 30 days. It is calculated for each user. Its value can range from 1 to 100. Higher the ‘conversion probability’ score for an individual user, higher is the probability, the user will make a purchase on your website in the next 30 days. Conversely, lower the ‘conversion probability’ score for an individual user, lower is the probability, the user will make a purchase on your website in the next 30 days. If the ‘conversion probability’ score for a user is close to 1 then it means the user has no probability of making a purchase on your website, in the next 30 days. If the ‘conversion probability’ score for a user is close to 100 then it means, it is extremely likely, the user will make a purchase on your website, in the next 30 days. If the ‘conversion probability’ score for a user is zero then it means GA could not calculate the ‘conversion probability’ score for the selected time period. Each ‘conversion probability’ bucket (except 0-1) is made up of GA sessions whose ‘conversion probability’ score fall in particular range. For example the bucket ‘51-100’ is made up of GA sessions whose ‘conversion probability’ score is in the 51-100 range. 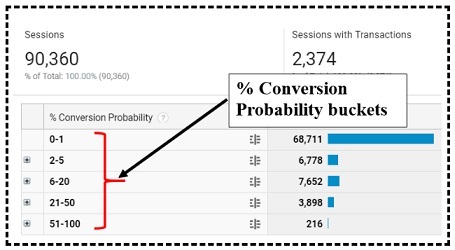 There is a possibility that you do not see a particular ‘‘conversion probability’ bucket’ or a particular range in your ‘‘conversion probability’ report. For example, you may not see the ‘51-100 ‘conversion probability bucket’ in your report, if no GA sessions were recorded for your website where the ‘conversion probability’ score was in the 51-100 range. 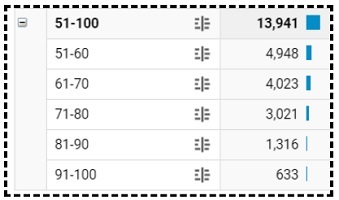 Similarly, you may not see the ‘91-100’ range within the ‘51-100 conversion probability bucket’ in your report, if no GA sessions were recorded for your website where the ‘conversion probability’ score was in the 91-100 range. Other thing to note that the ‘conversion probability’ buckets are not evenly distributed. For example the ‘2-5 conversion probability bucket’ contains 4 points of spread, whereas the 51-100 bucket contains 50. You may glance at the report and not realize that these rows are not equal. The ‘Average % conversion probability’ is the average value of ‘conversion probability’ score calculated for all users related to a particular Google Analytics dimension in a given time period. Note: The ‘Average % conversion probability’ score of 0.0 means the ‘‘Average % conversion probability’ metric was not calculated for all the users, related to a particular dimension, in the selected data range. A ‘conversion probability segment’ is a type of custom segment which meets certain range of ‘conversion probability’ score. 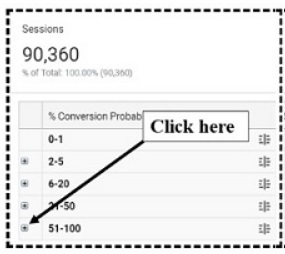 What percentage of your website users are most likely to convert in the subsequent sessions. How the website users who are most likely to convert in the subsequent sessions, differ from other website users, in terms of their website usage. How the marketing campaigns that generate website users, who are most likely to convert in the subsequent sessions, differ from other marketing campaigns. Which conversion paths are followed by the website users, who are most likely to convert in the subsequent sessions. Which conversion paths are followed by the website users, who are least likely to convert in the subsequent sessions. You can create a remarketing audience from a ‘conversion probability segment’. You can publish this audience to Google Adwords for running remarketing campaigns or publish the audience to Google Optimize for testing purpose. If you have used ‘session quality’ report before then you can now see, that is very much similar to the new ‘conversion probability’ report. If you are eligible for ‘session quality’ reporting, you are most likely eligible for ‘conversion probability’ reporting too. If you do not see the ‘conversion probability’ report in your reporting view, despite of being able to access the ‘session quality report’ then most likely, GA has not computed the ‘conversion probability’ data for your view so far. 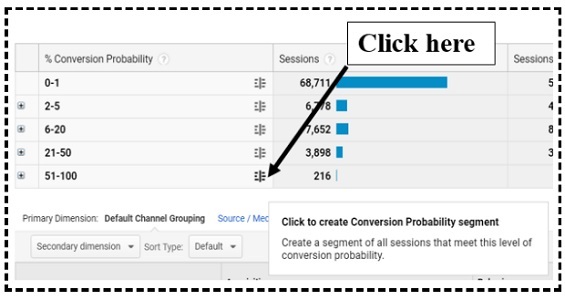 When that computation is complete, the ‘conversion probability’ report should be available in your reporting view. Though Google claims in its documentation that the ‘session quality’ report determine users’ proximity to transacting, the report itself talk about sessions proximity to transacting. As the name suggest, the session quality data is actually based on sessions and not users, and hence the report is named ‘session quality’ and not ‘users quality’. This is not the case with ‘conversion probability’ report where conversion probability score is calculated for each individual user. So Google’s focus on optimizing for users rather than ‘random sessions’, is a step in the right direction. However, Google is not transparent about its conversion probability estimates. It conveniently uses the word ‘machine learning’, wherever it is supposed to explain, how the conversion probability estimates are actually calculated. And this is now becoming a sort of trend, for Google. Just throw the word ‘machine learning’ somewhere in the documentation and then no one will question us. But marketers often forget that high value of data maturity is required, for a machine learning algorithm to actually work for your business and most organizations lack that. If a company has a high level of data maturity then it means it has immediate access to high volumes of high quality data from multiple data sources and it has people and processes in place to capitalize on actionable insight in a timely manner. Majority of companies, big or small, do not have the level of data maturity required to benefit from machine learning. Yet they still use and rely on machine learning tools, in a hope that by some magic, it will improve their website conversions. This could have dire consequences. Instead of improving sales their conversion rate and sales could tank. So can you trust the ‘conversion probability’ score? I leave it to you, to make an informed decision about it, through your own testing. I would use the more reliable method of creating remarketing audiences based on enhanced ecommerce segments. 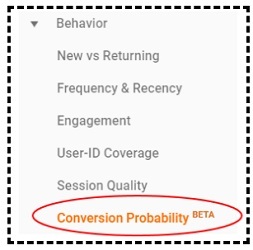 However, the ‘conversion probability’ report is still a nice addition to the Google Analytics arsenal.